Transmissions in commercial vehicles, SUVs, trucks and vans – particularly those used for hauling or towing – are subjected to severe-service operation and increased heat. Elevated temperatures cause fluids to break down, allowing damaging metal-to-metal contact and the formation of sludge and deposits. 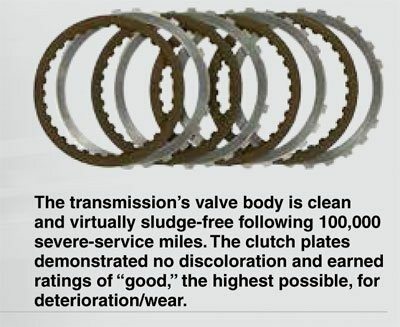 The problem is worse in modern transmissions with more gears, clutch packs and narrow oil passages that reqTransmissions in commercial vehicles, SUVs, trucks and vans – particularly those used for hauling or towing – are subjected to severe-service operation and increased heat. Elevated temperatures cause fluids to break down, allowing damaging metal-to-metal contact and the formation of sludge and deposits. The problem is worse in modern transmissions with more gears, clutch packs and narrow oil passages that require clean, high-quality fluid to achieve maximum performance and life. 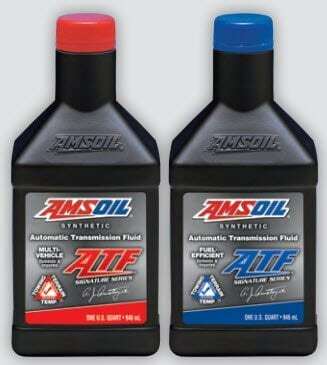 Amsoil Signature Series Synthetic Automatic Transmission Fluid is specifically formulated to withstand the rigors of heavy towing, elevated temperatures and challenging terrain. It remains fluid in sub-zero temperatures and provides reserve protection during heavy use and abuse.uire clean, high-quality fluid to achieve maximum performance and life. Signature Series Synthetic ATF is formulated with high concentrations of antioxidants, making it naturally heat resistant. It provides outstanding protection against sludge and varnish deposits that clog narrow oil passages and contribute to clutch glazing. 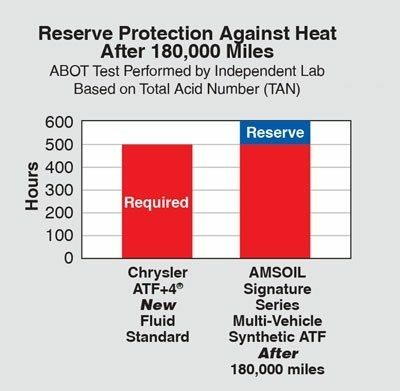 After 180,000 miles in severe service, fluid analysis revealed Signature Series MultiVehicle Synthetic ATF contained 83 percent of its original oxidation inhibitors, proving its long-lasting resistance to thermal breakdown. Varying speeds and loads causes torque multiplication and extreme stress on gears and bearings. 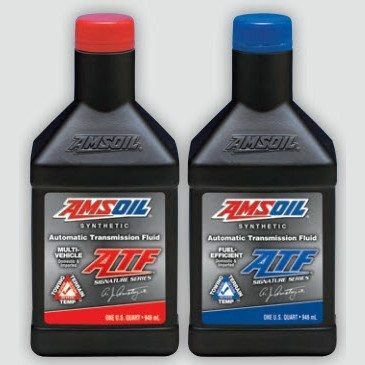 Amsoil formulated Signature Series Synthetic ATF with high film strength and premium anti-wear/ extreme-pressure additives to help prevent wear during severe service. In the industry-standard FZG Gear Wear Test, Signature Series Multi-Vehicle Synthetic ATF that had been used for 180,000 severe-service miles achieved a “Pass” at stage 12 – the highest stage. The results exceeded the Ford MERCON V and Chrysler ATF+4 specifications for new fluid, demonstrating the lubricant's long-lasting wear protection. 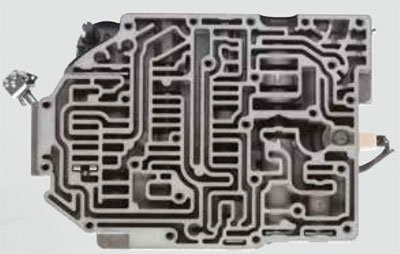 Today's transmissions are smaller and must withstand higher horsepower and torque while delivering smoother shifts, all with longer fluid life recommendations. 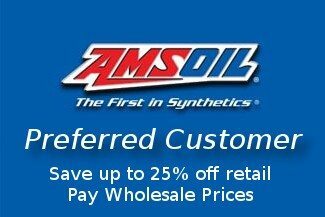 Amsoil Signature Series Synthetic ATF is formulated with friction modifier additives that deliver outstanding clutch-holding capacity (static friction), torque-transfer ability (dynamic friction) and anti-shudder properties (slipping torqueconverter clutches). Analysis reveals that after 180,000 miles in severe service, Signature Series Multi-Vehicle Synthetic ATF provides nearly identical friction properties as new fluid for smooth, reliable shifts. Change at the vehicle manufacturer's recommended drain interval outside US. and Canada. This product is not expected to cause health concerns when used for the intended application and according to the recommendations in the Safety Data Sheet (SOS). 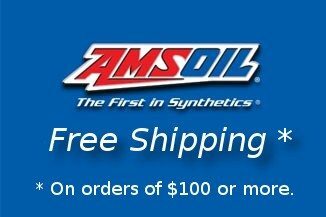 An SOS is available via the Internet at www.amsoil.com or upon request at (715) 392-7101. Keep Out of Reach of Children.